More than 20 years ago, Pete told me that he got the name Manna Liquors, which was Varick Street, from the bible, during the 40 years journey from Egypt to the Land of Milk and Honey when the Israelites were starving and the lord sent down bread from heaven. Years later, his sister told me he had entered seminary, he studied to be a priest. I used to drink more than I do now. This has been my liquor store since 1991. Retail and dry cleaner loyalty is an urban thing. I generally only go to a specific dry cleaner, Korean green grocer, and about two bodegas, and a specific liquor store. There are plenty in the neighborhood, and generally loyalty is based on the proximity to your apartment, but it is loyalty nonetheless. The only non-bar booze I’ve ever bought in J.C. was from Manna Liquors. After the 90s, my drinking at home diminished but I am good for a couple of (small) bottles of Makers Mark and/or Jameson’s a year, especially around the holidays and the occasional six pack or bottle of wine. Luckily, the thirst for booze has not diminished in the neighborhood and there were plenty of new customers to take up the slack. 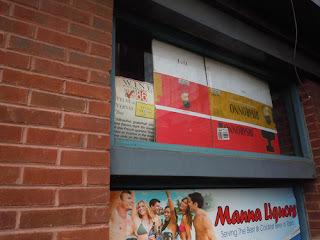 I’m not a wine drinker, but others praised the Manna wine selection. I helped his nephew write his first resume. Pete’s Vietnamese. He’s lived here since the war. This other time – I won’t bore you with how this circumstance arose – but I was addressing a group with many Vietnamese-Americans in it and being February, it was the eve of TET, the Chinese New Year, celebrated by most Asian cultures. So, Pete taught me how to wish them a happy Tet in Vietnamese. The Jersey Accent does enough damage on our native tongue so you can imagine how easily it mangles the sing-song rhythms of Vietnamese. But he took the time and we had a lot of fun and I surprised all the people I was speaking to with my rehearsed greeting. I don’t remember how to say Happy Tet in Vietnamese, but I’ll never forget the time spent with Pete. Sometime after 9-11, he gave the store to his sister and opened up a 2nd Manna Liquors somewhere in Brooklyn. Before he did, they renovated the store, putting in new shelving, “yuppifying” it. They did a nice job. Beautiful wood shelving, like you see in California wine country casks, soft lighting. Then, before he moved, he threw a block party in the courtyard of the adjacent apartment complex. All his family and all my neighbors were there. Vietnamese spring rolls and barbecue ribs were served; free booze of course. He took Polaroids of everybody and we signed our names in an album under our pictures. After the sister took over, the album was on display. I flipped through it many times. It is storeowners like this that turn a neighborhood into a community. The mold has been broken and they are not making any more like this, it seems. His sister carried on that tradition. She is beautiful and warm and just so friendly. Had some kids, ran it with her husband who loved football. Asking about Pete and shooting the breeze for my Christmas Makers Mark or in November, buying the Beaujolais Noveau to have with the Thanksgiving turkey, year in and year out. The fact that a weekly customer and long become a two or three time a year customer did not matter, the warm friendly smile, the glad to see you expression. Merry Christmas, Happy New Year, it is an annual tradition… or was. She had already moved from Jersey City. We have mutual friends who are Vietnamese and there has been somewhat of exodus out of Jersey City, to the suburbs. 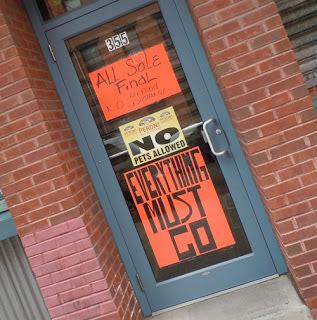 I do not necessarily pass this store often but today I did and saw that it was closed, going out of business signs, everything must go. Her husband waved to me about a week ago or so, recently… I didn’t see any signs ... it was after Labor Day. 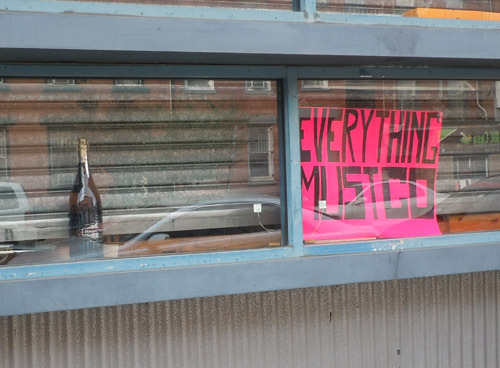 After I got over the shock, I talked to the bodega owner across the street. The closing was announced a week ago, maybe less. The inventory was sold and they’re gone. She said the decision was sudden. 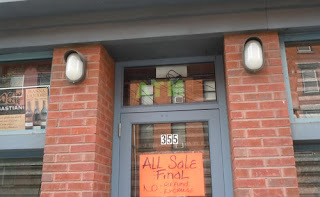 She said there was back and forth with the building’s owner, who stated adamantly that 25 year lease that would not be renewed and they did not want to buy the space. I do not know all the details, and I’m not about to speculate, but the fact is, that blows. In this economic climate, not to renew a lease on a business that is still succeeding? There is no available parking on this street, the space can really only be a local store (although crack den or massage parlor are possibilities). The nearby space also owned by the same building is a former Video Rental Store and has been unoccupied for about a decade and that ain’t no lie. Real Estate in Jersey City operates under a logic alien to the rationale mind. I was also informed that Pete is very sick and for reasons unknown was not selling the liquor store license, an expensive and valuable certificate in this town. There may be more to the story than I know and I’m just reporting what I heard second hand. Who cares about the why’s and related gossip. The fact is we’ve all been depleted. I’m teary eyed as I write this. It’s like a kick in the gut. I’m also mad I didn’t get a chance to say goodbye. 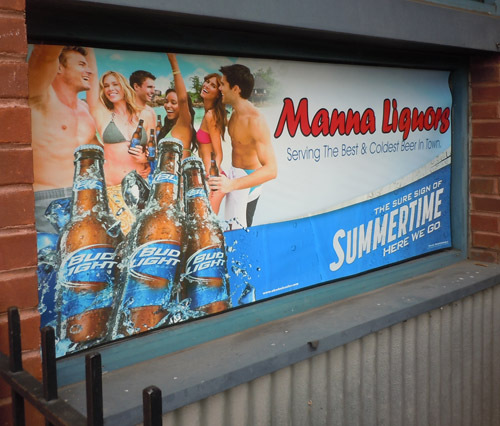 Manna Liquors served the community and has been here for as long as I have and the fact is that, like so many other places that served the community and has been, it too now is gone. I'm sad. Despair is something I do not need more of than I already have but sometimes it seems it is the only thing that keeps coming my way.